again a 1 hour game and a good defense from Luckypapa. Finally I won. 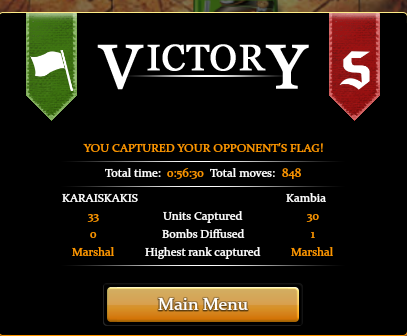 Kambia and Karaiskakis are going to play right now. I had to bail on Luckypapa at the last moment... but spyros77 was nice enough to destroy me a short time later. boy was I outclassed! Enjoyable battle resulting in victory for Napoleon, well played :-)! thanks yes it was a good game with some thrill. Thanks for the game Sgt. Blkdog. sgt blkdog and I are about to play!